With the long dark nights drawing in now, along with the rain and colder days it probably doesn’t feel like the best time to launch a healthy lifestyle campaign and set yourself some goals. With only a few weeks to Christmas, the parties, the food and drink, the celebrations with family, friends and workmates and the mounting temptations with open boxes of chocolates everywhere, the better option can seem to wait until January to get yourself in gear and put healthy lifestyle choices into practice. You may have been flying it with your weight loss and exercise goals but lately may have experienced a few wobbles, may have fallen off the horse altogether and could be deciding at this stage to relax your disciplines and hold off until the New Year to reapply yourself to attaining your goals. STOP! Now is the perfect time to reflect on where you are and where you want to be. Don’t put it off. Don’t give up and do not quit. Every single day is a new fresh opportunity to generate a positive impression on your health and fitness goals. You can choose to move mountains in the next 8 weeks if you apply yourself and believe to your core that you are unstoppable. Get behind yourself and gift to yourself the courage to pick yourself back up if you have fallen or if you are just starting out, to start now and not wait until after Christmas. How do you go about setting your goals and creating a strategy that will enable you to attain them? At the start of my own healthy lifestyle campaign I applied the SMART goal setting system. 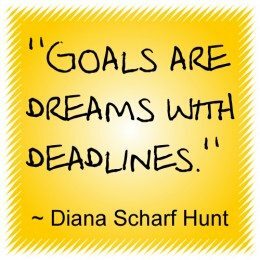 This means your goals must be specific, measurable, accountable, realistic/relevant, time-based. Specific – Just nursing a notion or desire to “lose weight” or “get fit” is vague with no real concrete direction or real substance. Define clearly what you want, what your goals are. I knew I wanted to lose weight but it wasn’t going to happen on its own. When I sat down and wrote down exactly what I wanted, I could be more clear and concise and formulate exactly what I wanted to do and how to do it. “I want to lose 9 stone by losing a healthy average of 2.5lbs per week” is a precise and unambiguous goal for me. “I want to run again” is unspecific and uncertain. A more authentic and distinct goal is “I will start a run/walk training programme with 30sec run/1min walk intervals to start with, building up the running intervals and to participate in a 5K race on completion of the training programme”. Be specific. Write it down. Measurable – You need to decide how to measure your goal and break down your progress ahead into chunks. 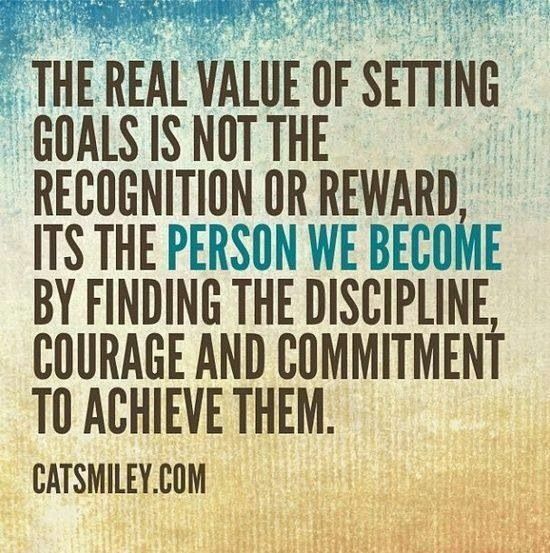 Your goal must be measurable to help ensure your success in achieving it. 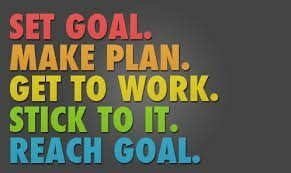 Decide how many pounds/inches you want to lose, what fitness level you want to reach and break it down into safe weekly targets. Write it down. I broke down my weight loss into weekly targets of 2.5lbs with an estimated goal for each month. Every week and every month I refer to my notebook where I’ve recorded my goals and action plans to see where I am, how far I’ve come and what I need to continue doing to ensure continued success. I have a graph on my kitchen door where I track my weight loss every week and watching that progress line move downwards is very gratifying and motivates me to continue. At the beginning I took two glass jars and filled one jar with 133 glass marbles, signifying how many pounds I wanted to lose. The second jar was empty. With every pound I lose I move a marble from one jar to the other. The first jar now has 80 marbles (pounds to go) and the second jar now has 53 marbles (pounds lost). Measuring your progress gives you a clear path to assess and reflect on your progress. Be diligent and track how you are doing. By being able to track, measure and reflect on your goal progression you can tweak and adjust areas that may not be working and implement any changes you need to make, helping to ensure you stay on track and motivated. Accountable – What actions are you going to undertake to hit your goals and how are you going to make yourself accountable? Calculate what your daily food allowances and exercise targets are to help you make concerted progress towards your goals. 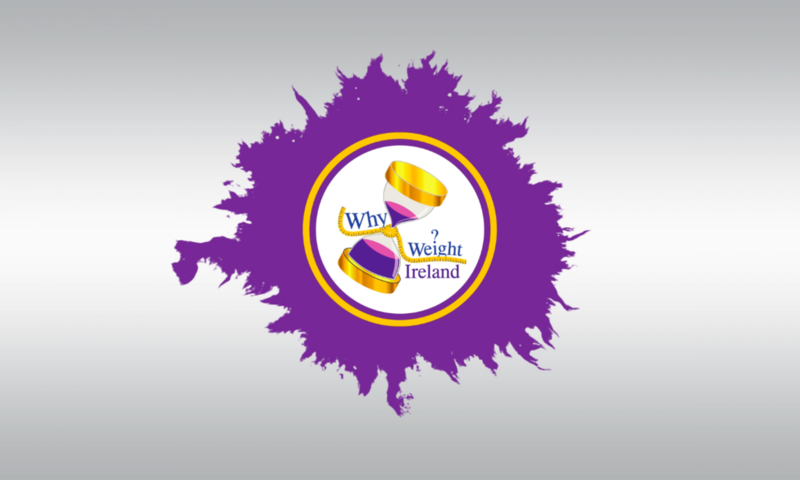 I find using the Why Weight Ireland Food & Exercise Diary a perfect tool in helping me to stay accountable. It is so easy and fun to use. It takes the hard work out of calculating calories as it does it for you. Daily allowances for food and exercise are determined for each individual by height and weight entered and how active you are. Knowing I have to honestly fill out the diary every day keeps me answerable and empowers me to feel in control of my progress. 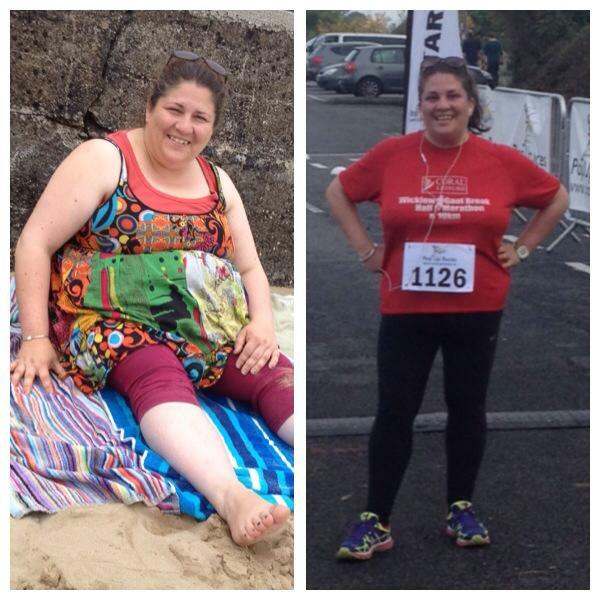 My weight loss of 4 stone over 22 weeks bears testament that this method truly works. Weekly update reports to Hannah also help towards keeping me accountable. Realistic – Your goals need to be realistic and relevant to YOU. It can be very tempting to reach for the quick-fix diets and weight loss gimmicks which are generally unrealistic to maintain and unhealthy. A few years ago I followed a liquid meal-replacement diet and lost 3 stone in 9 weeks. The exceedingly swift weight losses were addictive. However when I finally stopped and started eating real food again my hair started falling out in clumps and I horsed back on all the weight plus lots more besides and hadn’t learned one iota about nutrition or nourishment or how to sustain healthy food choices for life. God knows what it did to my metabolism. Your goal needs to be something you are willing and capable of working towards. You can start small and build up your achievements. There are basic healthy and realistic choices you can start with like drinking your eight glasses of water daily, getting in some exercise every day, making tasty nutritious meals etc. These are sustainable, realistic goals to strive for. Decide what yours are. Losing weight is not easy. There is no point in codding yourself that it is. It IS possible though when you plan your strategy down to the last detail and keep things realistic, which also helps to keep you from feeling overwhelmed with it all. Envisioning yourself losing a stone in 4 weeks is not realistic. When you set the bar too high for such a short time-frame you set yourself up for disappointment and a drop in motivation when you can’t keep up. Your realistic strategy for reaching your goal will be challenging for sure but enticingly so if you allow it to be, to keep you motivated and not tormented! Set smaller mini-goals so when you reach them it will build your confidence and keep you inspired to keep going and moving forward. Be honest about your fitness levels. If you haven’t exercised in forever and live an inactive lifestyle, don’t rush off at the start and commit yourself to 5 bootcamp classes per week or lace up your runners with grand plans to run 5 miles on your first day off the couch. Start from where you are and take it from there. Fitness levels need to be built up gradually and safely to help avoid injury and possible burnout. Time-based – When you have chosen a realistic goal, you need to choose a realistic time-frame to accomplish it in. If you want to lose 2 stone but are vague about the “target date”, then what are you working towards? Having a target date helps focus your mind and harness your commitment levels. Knowing you have a time-line with an end-date to work towards means you can reflect on your progress every week. You can see clearly how far along you have come, how far you still need to go, and can make any adjustments to your action plan to keep you in line with your goal. Establish a time-frame for your goal as this can motivate you to light a fire beneath you to make the changes you need to make. After the glorious success of running in last week’s 5K race I decided I’d do another one this weekend for the craic! 🙂 It was only half a hours drive away so motored on over to Paulstown on Sunday to take a place at the start line. I didn’t know a soul there but it was fun to talk to new people, presenting another way to step out of the comfort zone. Seeing as I managed to run for 38 minutes before needing a walking break at last week’s race I decided to aim for 40 minutes non-stop running before taking a walking break for this week’s race. It was an exhilarating experience and I enjoyed every step. I kept my pace steady and didn’t try to keep up with anyone and incredibly I succeeded in running the entire race non-stop, crossing the finish line at 45:42!! Now it was more of a shuffle really but the main thing is I got out there and pushed myself and was delighted to have stretched what I was capable of achieving. My goal for this week was to lose 2lbs to reach 13 stone 10lbs, which would bring me to a 4 stone loss in total, however I’ve actually gained 1lb!! (Nibbling at the children’s trick or treat stash did not help.) So I’m drawing a line under it and will not beat myself up over it. Today is a new day, this is a new week, I will motor onwards. My weight loss so far in 23 weeks is 3 stone 11lbs with 80lbs to go!! I’m delighted to have Hannah’s 6 Week Pre-Christmas Challenge to launch into this week and will up my game to have another stone lost by New Year’s. Please find below some of my favourite recipes. 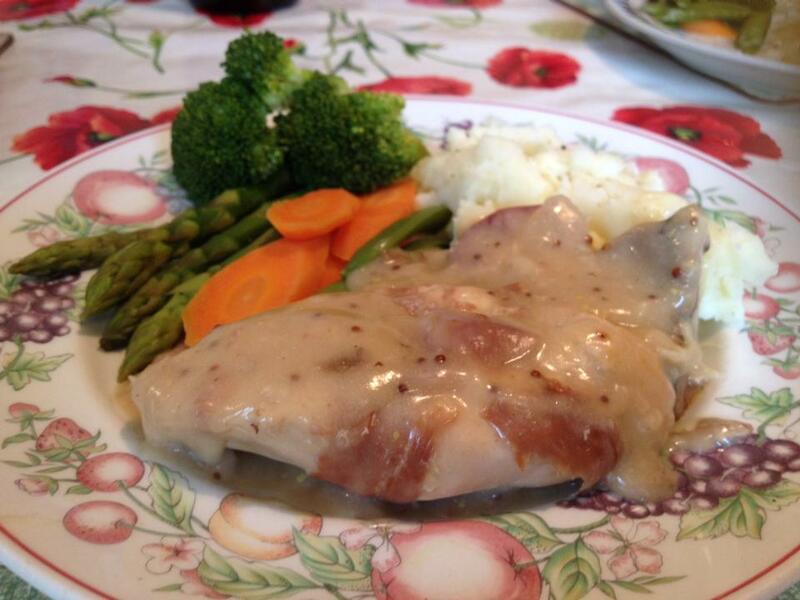 I’ve adapted this recipe from one I found in one of my Nanny Maura’s Woman’s Own magazines. At first taste this casserole will have you closing your eyes in bliss and drooling. I absolutely love it and have finally gotten to grips with how to thicken casseroles using cornflour! Thank you to all who responded with your great tips when I sent out a cry for help while trying to teach myself the correct method 🙂 This dish is perfect comfort food now for the long evenings drawing in and perfect with mashed potatoes. Sometimes I add carrots and mushrooms to the pot, whatever is handy and if I don’t have bacon rashers I use Parma ham. You can use apple juice instead of the cider if you prefer. The casserole recipe alone is 331 calories per serving. Plated serving above including the mashed potato and vegetables is 550 calories. Enjoy! Preheat oven to Gas Mark 5/190 C. Season the chicken. Wrap each chicken piece in a bacon rasher and cook in a large flameproof casserole dish using Fry Light. Cook over a high heat for about 10 minutes until both sides are browned all over. Add the red onion slices and cook for a few minutes. Add the cider and chicken stock and bring to the boil. Cover, take off the heat and place in preheated oven for 40 minutes until the chicken is tender. Remove the casserole from the oven after the 40 minutes and place back on the hob. Add the creme fraiche, dijon mustard, wholegrain mustard. Mix the cornflour with about 1 tablespoon of cold water and mix until well combined. Stir in to the casserole. Bring to the boil, stir again and simmer for about 3 minutes or until the casserole thickens. Serve with lovely mashed potato and vegetables. 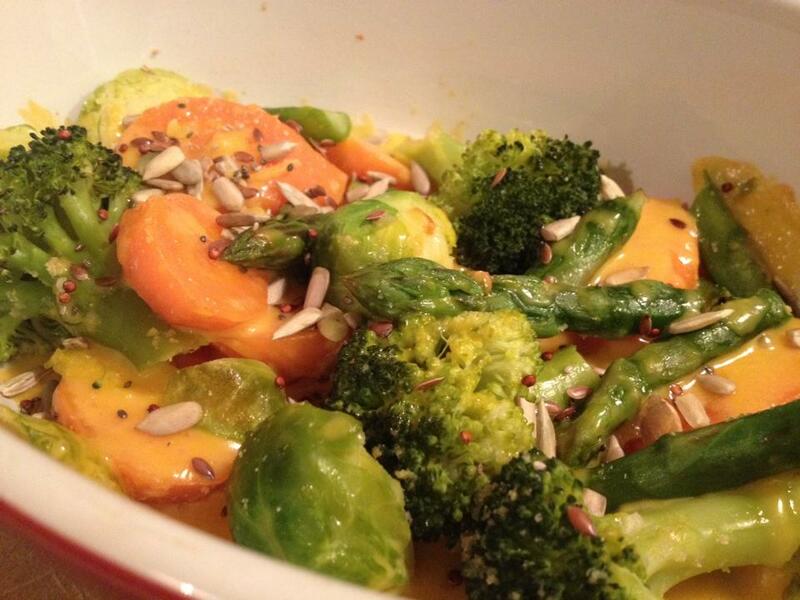 This is a lovely light but filling dish and one of my favourite ways to serve vegetables. Serves one at 260 calories. Preheat oven to Gas Mark 4/180 C. Place vegetables in a pot with cold water and boil until you can pierce with a fork but are still firm. Drain the water off and mix half the grated cheese through the vegetables along with the onion powder and garlic granules. Place in a shallow oven dish and sprinkle remaining cheese on top. Cook in oven for 5 to 10 minutes or until the cheese has melted. Sprinkle over the Super Seed Sprinkles and serve. Enjoy! Next PostNext Time to Sparkle!